Hold some button turn the track or song view into a parameter view per step. Each step is a column of different height showing current selected parameter level for each step. Step value can be entered per step or automation between 2 step created by holding 2 different step filling the space between with a gradiant of value. Horizontal zoom level is active and can be changed. In this view, each button of the audition column show and bring to a different parameter automated for this track. The mute column turn on/off the respective parameter automation. Tracks and song has their own automation view. I can’t believe nobody is interested in this. I am not being clear? I hope so. How one wouldn’t be interested in using their 16x8 grid of button to draw music. Pretty sure Rohan and his team are reading all post regardless of their popularity and will go with the best ideas. I would assume that they had thoses ideas way before we did. I think I understand what you mean. Are you saying draw parameter values per step horizontally? If so, what would each button represent in numerical value? 100% divided by 8 buttons? Zoom in to get finer resolution? Yeah - great idea here. Took me a few times to understand what you meant. @llexam - He is saying that - I think. And, he’s also saying each step would represent the level of the automation for that step. So, say on step four, you might have the first four pads light up (vertically) to represent 50% of that parameter value at that step. If you press the 8th row at that step, it would be 100%, and all rows beneath would be lit up. Great stuff. @jbone1313 I see. This is truly a great idea. Yeah, that is pretty much it. All in the hands of the developper in the end. Good news that it has been brought before, votes are overrated. The parameters ramp up or down by drawing a line between 2 steps of different value could allow some cool automation effects. It is basically drawing an enveloppe for a parameter. SICK!!! How come a feature to visualize and draw automation on a grid is not sparking a deluge of enthousiasm among users?!?! Accessing automation view could be done by pushing twice on one of the 8 parameter button making it blink. Pushing once on an other parameter would keep automation view but show this last one. Turning one gold nob would switch to its parameter view. On the grid, holding one of the pad + turning parameter knob would edit this step value allowing more precision than the 8 vertical pad. Values that are between 2 pads could be shown by brigthness variation of the last vertical pad of the colomn ( just like the 4 leds next to gold knobs). For me, the deluge concept and harware is just calling for this automation drawing feature. I’d really like to hear what @Rohan and @Ian_Jorgensen think of this idea. +1, the Deluge grid is absolutely crying out for this feature! +1 I’m totally on board with this. Even if it started with a simple parameter like volume. Having the ability to draw in levels per step (ala Launchpad’s mixer page) is a huge time saver and give a better idea of what’s going on in the track as a whole. +1 It would also be good if it allowed you to smooth the points between steps so that you could easily create an automation ramp that isn't jagged. +1 I can vouch for this! +1 I need this function!!!! It definitely needs a vertical & horizontal zoom feature, so this also works for MIDI tracks with 0-127 midi CC parameters. The green modulation would always be played. 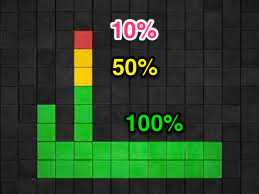 In 10% of cases it would modulate all the way up to red for the 3rd step, and in 50% of cases up to yellow. I recently joined the forum and posted a similar request. Here's a full description of how I envision the feature working. It is hard to get automation exact, and it's difficult to sequence precise automation. There are only 2 LFOs, which we could get around with automation sequencing but can't currently because it's not as accessible as other sequenced elements. Allow users to view the automation track for editing within the pattern/sequence area. As a result, automation can be copied, pasted and sequenced along with all of the other deluge components, opening up a world of possibilities. Note: This 'value sequencer' could be used for pure CV tracks, drastically extending the deluge's CV sequencing capabilities. 1. Quick access: Hold down [track] and press the [gold knob] to load it's automation data. 2. Standard access: Double press [track]. The light will blink indicating that it's waiting for a parameter to be selected as an automation source. Press [function] and a parameter on the grid to load it into the track automation view. While in track automation view, the track button should stay blinking. This allows users to press [function] and another parameter to quickly jump between different automation lanes quickly. A double press of the track button should load the last loaded track automation parameter. The 16x8 grid would display values vertically across horizontal time, matching the sequence's length and zoom (zoom match allows for quick instances of popping into track automation view and then back into note editing view by pressing track again. Notes on the sequence will be displayed as faint white lights to help position automation relative to note data. Pressing/holding and turning the [^/v knob] would vertically zoom the possible values that can be entered. Pressing a square on the 16 x 8 matrix would add a red dot, indicating the value. Pressing the square again would remove it. Press and hold an automation value and then press above or below it to add attack and decay to the value (and/or) press and hold an automation value with 'attack and decay' set to the gold nobs to set attack and decay for the item. Attack and decay would apply to automation items if [affect all] is lit. The number of squares above and below indicate time relative to the zoom level. Relating the units like this makes it easy to visualize how the tails transition. Pressing record and turning the [select] knob would record values from the select knob as automation with touch style automation recording (perhaps pressing it could alternate between touch and latch. Cross screen, copy, paste, undo, and clear would work as expected with these tracks as well. Parameters like pan that have positive and negative values would start as being set in the middle as light green squares. When active they would be bright green. Values above and below the '0' point would be red dots as with other automation values.